Oscar Freire has single-handedly changed the face of Spanish cycling from its obsession with tours, and above all mountain stages, and opened up the public's appreciation to the delights of one-day races. He has won six stages of the Tour of Spain, three on the Tour de France, is twice winner of the ultra-prestigious Milan-San Remo and above all, is triple world road race champion. In fact every time a race ends in a bunch sprint it's worthwhile keeping an eye out for the speedy Spaniard who won his first title in Verona in 1999 at the age of 23, just two years after turning professional. He will be particularily motivated at the Beijing Games after he abandoned during the road race at the Olympics in Athens under searing conditions and on a gruelling circuit. Freire leapt from obscurity to be crowned world champion at Verona in 1999 despite having just one modest victory to show for his two seasons of professional racing before then. His success at world events ever since has been impressive. He was third at Plouay, France in 2000, and picked up the world champion's rainbow jersey again the following year at Lisbon. His small but muscular physique enables him to burst into sprint in the rush for the line and his Rabobank team manager Jan Raas says of him: "Oscar is just the kind of rider we need. He has excellent sprinting qualities and is able to pull away from the pack in the final part of the race." But Freire is something of a thoroughbred in that while his physique is fine-tuned, it is also rather fragile and he tends to have frequent aches and pains. Long before his cycling career started he underwent three operations to avoid the amputation of a foot, and since taking sport seriously he has suffered recurrent back problems that have hampered many of his seasons. It is almost certainly for this reason that the Spaniard, who picked up a stage win at the 2002 Tour de France and two more in 2006, has not won more of the great classics on the racing calendar. He was born in Cantabria in 1976 and therefore should have a good bit of road ahead of him to attain that goal. 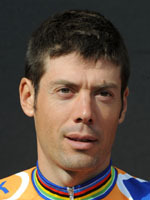 He joined Dutch outfit Rabobank in 2003 after two seasons with Italian outfit Mapei and despite his Olympic setback in 2004, consoled himself with a third rainbow jersey in Verona, becoming world champion for the record-equalling third time.